Dunning Tract looking west. In the lower right corner is US Rt. 20 and Grace Chapel. 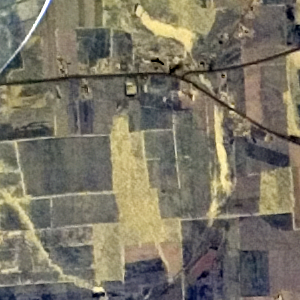 The Dunning Tract is located on the south side of US Rt. 20, just east of the intersection of NY Rt. 175. 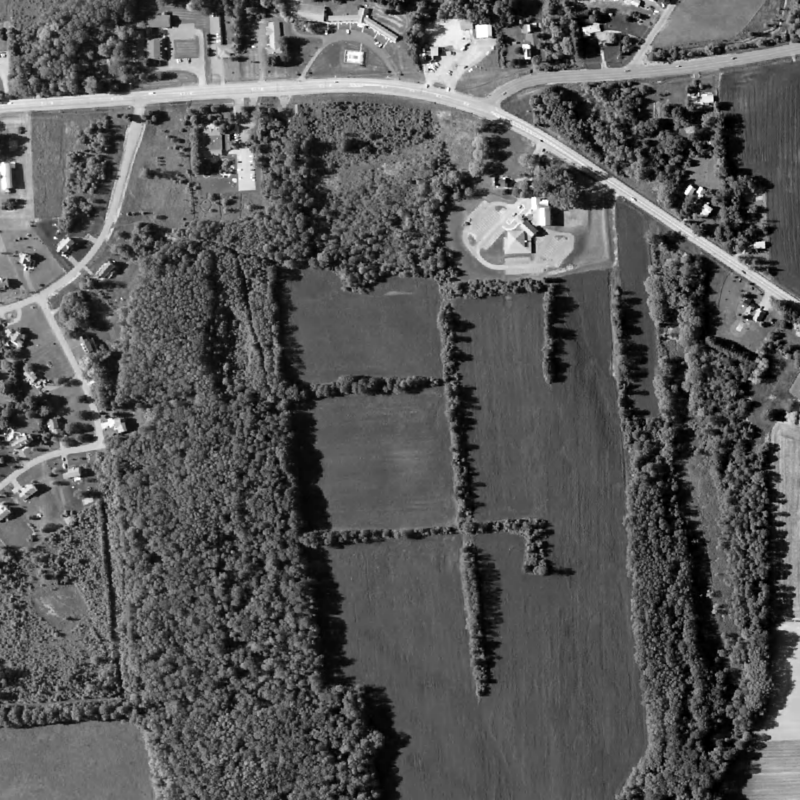 This now 88.9-acre property was given to the town in 1973 by Kenneth Dunning, a former Skaneateles real-estate developer and owner of Roosevelt Hall, then residing in Florida and North Carolina. Later documents indicated that property had 100.1 acres, so either both of the following two 1973 articles were incorrect (one says 80 and the other says 88) or acreage was added to the property at some time between 1973 and 2010. Dunning tract. May 12. 1972. USGS. 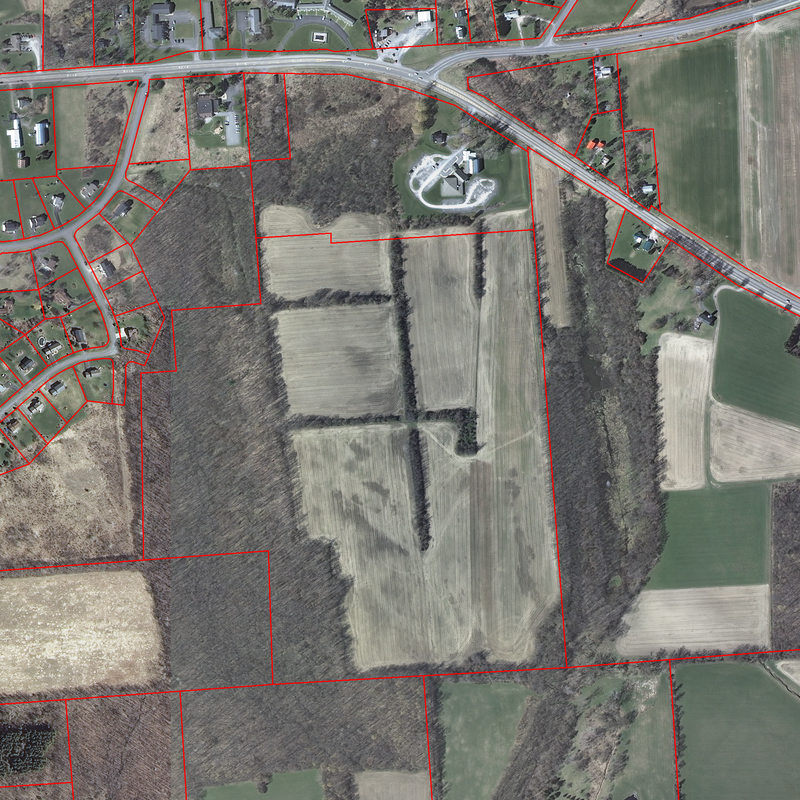 A 80-acre gift of land, assessed at $100,000, was donated to the Town of Skaneateles at last week’s Town Board Meeting according to Jack Bryant, town attorney. 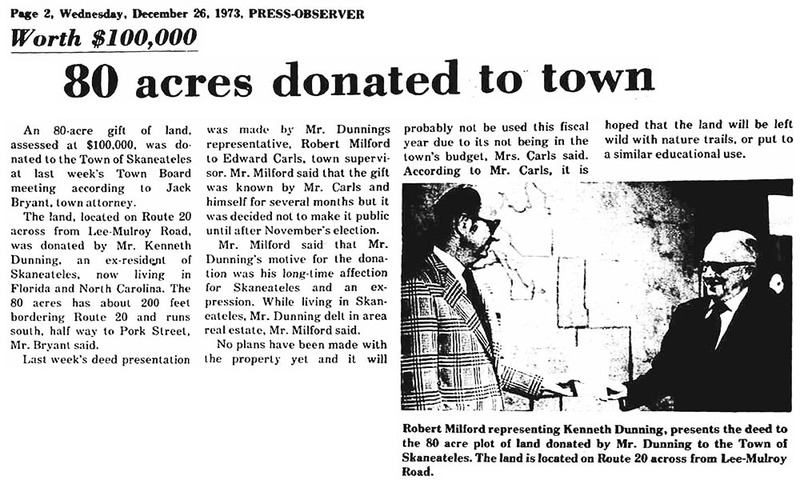 The land, located on Route 20 across from Lee-Mulroy Road, was donated by Mr. Kenneth Dunning, an ex-resident of Skaneateles, now living in Florida and North Carolina. The 80 acres has about 200 feet bordering Route 20 ant runs south, half way to Pork Street, Mr. Bryant said. Last week’s deed presentation was made by Mr. Dunning’s representative, Robert Milford to Edward Carls, Town supervisor. Mr. Milford said that the gift was known by Mr. Carls and himself for several months, but it was decided not to make it public until after November’s election. Mr Milford said that Mr. Dunning’s motive for the donation was his long-time affection for Skaneateles and an expression. While living in Skaneateles, Mr. Dunning dealt in the area real-estate. No plans have been made with the property yet and it will probably not be used this fiscal year due to its not being in the town’s budget, Mrs. Carls said. According to Mr. Carls, it is hoped that the land be left wild with nature trails, or put to a similar educational use. 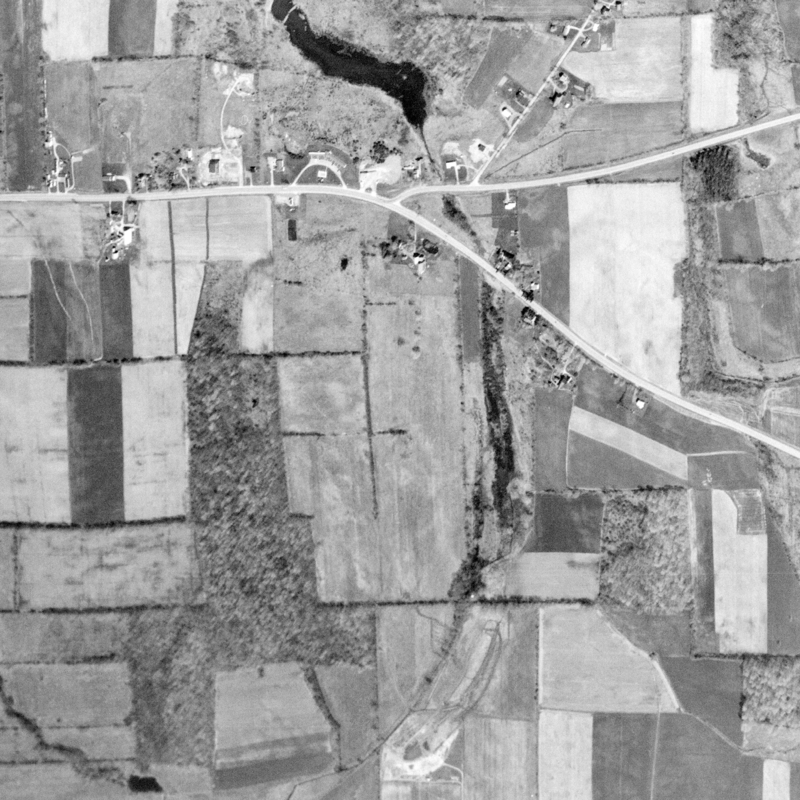 Dunning property aerial photo Apr. 17, 1974. USGS. 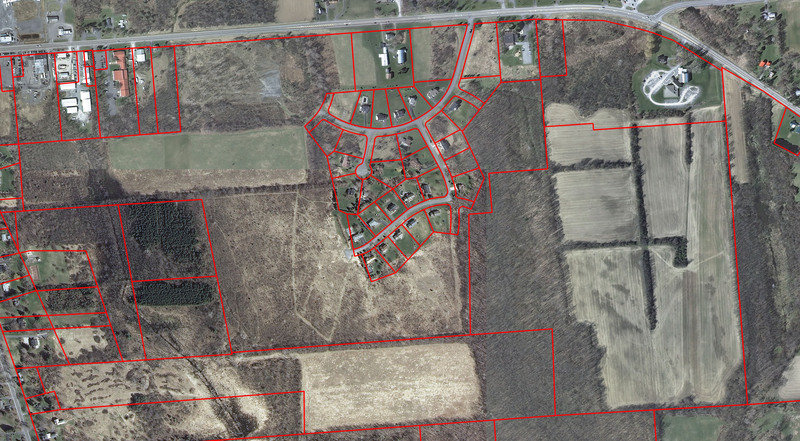 A former Skaneateles resident has given 88 acres of land, valued at $100,000 to the town. Kenneth Dunning, now living in Miami, Fla., deeded the land to the town without restrictions concerning its use. Offer of the gift was made at a recent special town board meeting by Dunning’s attorney, Robert S. Milford. Supervisor Edward Carls, acting for the town board, accepted the land. The board decided to turn the question of the use of the land over to the town planning board. 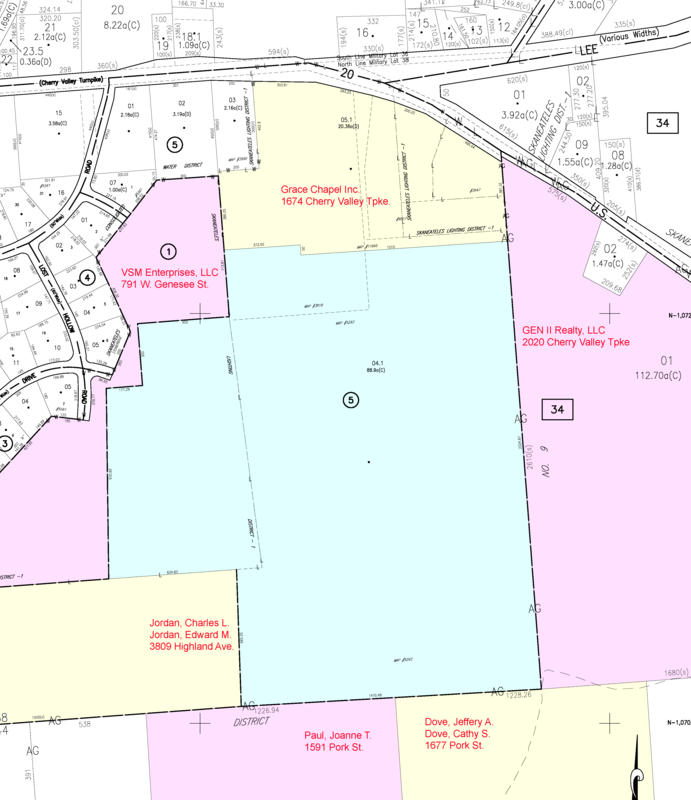 The land has 700 feet of frontage on Route 20 at the intersection with Lee Mulroy Road. and extends southward. It is 14,000 feet wide at the rear, north of Pork Street. Arrangements for the transfer had been kept secret for months a Dunning’s request. At the presentation, Milford expressed Dunning’s gratitude that the gift was not made an issue in the local election which cost the supervisor his job. Dunning originally had hoped to turn over to the town all the stock of a corporation which had as its sole assets the 88 acres of property. Skaneateles’ attorney, John Bryant, sought a legal opinion of that type of transaction from the state attorney general, Louis J. Lefkowitz, and was informed that the town could accept the land but not the corporation’s stock. Dunning then liquidated the corporation which deeded the property to him. He, in turn, deeded the property to the town. The entrepeneur is known locally for his large and successful investments in real estate for the past 15 years in the Skaneateles area. The [Skaneateles Town] board will host a public hearing about an arrangement with Grace Chapel on Aug. 19. The town agreed to sell the church acres of undeveloped land next to the sanctuary in exchange for $87,500 and permission to access the rest of the town’s conservation property. While the town already approved the land sale, officials requested that the church draft a contract about the town’s rights to reach the remaining land. During non-peak church hours, the town will retain access to its landlocked acreage and is free to use the parking lot of the church. Town officials have discussed using the remaining land for athletic fields. While no building plans have yet materialized, the town wanted to keep its options open for the future. In addition, the town will have to complete a State Environmental Quality Review for the project. 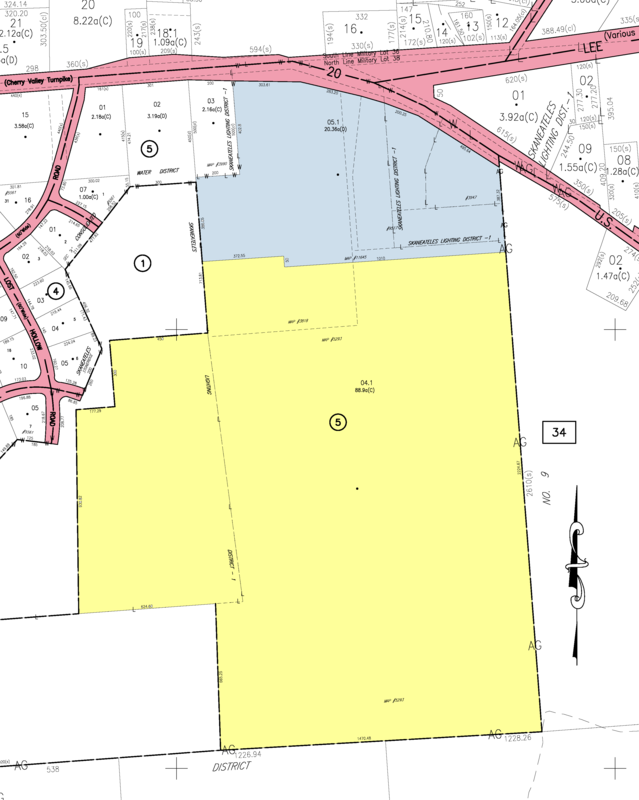 Dunning (town conservation) property in yellow. Grace Chapel property in blue. From Onondaga County Tax Map 042, March 2014. 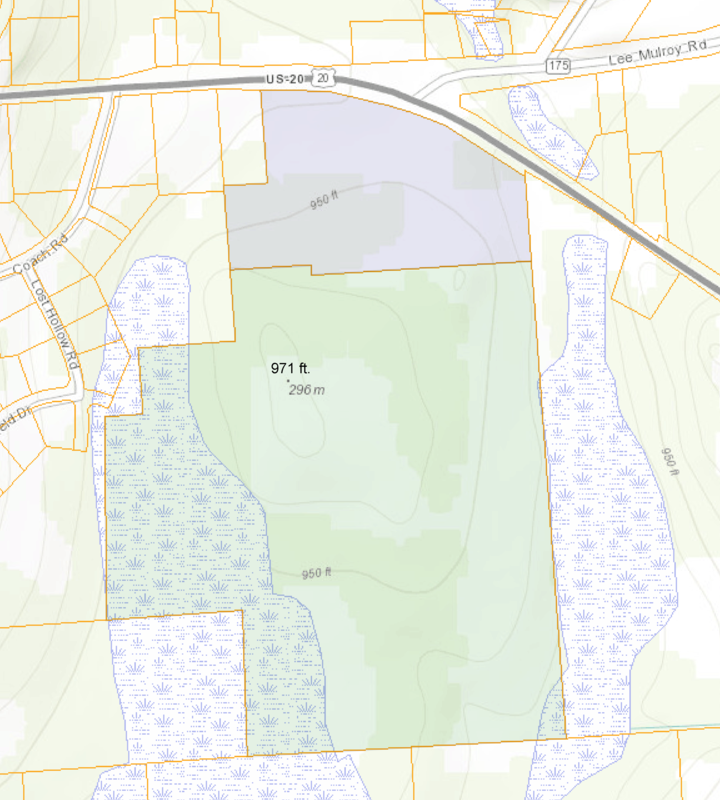 Grace Chapel Public Hearing: Ron Hosie represented Grace Chapel and outlined the church’s position in regard to acquiring 12.2 acres of the town’s conservation land south of Route 20 (adjacent to Grace Chapel). He said they have been working on this for four years. The short story is that in 2005, Grace had a growth spurt, which created a need for more parking. People have been forced to park along Route 20, which is dangerous. Grace Chapel would purchase 12.2 acres of the town’s 80 acre Dunning property at a price of $87,000. It would also give the town an easement / right of way for the town to be able to gain access to the rest of its Dunning acreage. The Dunning property has been under consideration to be used as additional athletic fields. Hosie had a letter from the school superintendent saying the school district did not object to this sale. No one spoke out against the sale at the public hearing. The final two public hearings of the night concerned a previously-approved property conveyance to Grace Chapel from the town, specifically the release of a 30-foot drainage easement and a right of reversion. The reversion interest is under the condition that the conveyance is effective as long as the property is used for religious purposes and no other, and is used by Grace Chapel or its legal successor. Both public hearings had no public comments, and both the release of easement and the right of reversion were approved unanimously by the board. Sardino announced that final approval for the property conveyance to Grace Chapel from the town is nearly ready. He requested that the board authorize Roney to sign the official paperwork to affect the transfer and receive the money, which the board unanimously did. The property conveyance concerns the release of a 30-foot drainage easement and a right of reversion. Dunning Tract, April 3, 2012 (USGS), with 2014 property lines in red. Grace Chapel Resolution: Attorney Sardino said that the transfer of the property that the Town Board agreed to sell Grace Chapel was getting closer to being finalized. Grace Chapel’s lender is requesting a resolution from the Town Board that verifies that the Town is satisfied that the conditions have been met and the sale will go forward. Mr. Sardino also said that a prior Town Board had designated that the proceeds from the sale, $87,500 would be divided equally between the Agricultural Preservation Capital Reserve Fund and the General Reserve Fund for Outdoor Recreation Purposes. He said that the current Town Board is not bound by a prior Town Board decision and asked the Board if they still wanted the proceeds to go into these two Reserve Funds. He said the Agriculture Capital Reserve Fund is funded by applicants who want to increase density on a receiving parcel by making a financial contribution to the Town’s Land and Development Rights Acquisition Fund also known as the Agriculture Preserve Capital Reserve Fund. Bridgett Winkelman said that the Agriculture Preserve Capital Reserve Fund has been receiving funding from this for approximately five years. right of way agreement for parking and access to the remaining part of town property and other purposes as outlined in such agreements for consideration of Eight Seven Thousand Five Hundred Dollars ($87,500.00) and further resolved to determine where the funds will be deposited at a later time. Contour map of the Dunning tract with elevation and wetlands indicated. Grace Chapel is requesting an extension to the prior April 17, 2012 extension approvals. There are no changes or adjustments; the applicant needs an additional six months to finalize the sale of the property and filing of the revised plat plan. WHEREFORE, a motion was made by Member Alan Briggs and seconded by Member Don Kasper to approve the Extension as presented, and that the Resolution memorializing the Approval is hereby ratified, confirmed without modification and extended by six months, to extend the Applicant’s time to fulfill the required conditions thereof, as if said Approval was dated the date hereof. Upon a motion made by Member Alan Briggs, seconded by Member Don Kasper, and upon a vote thereon, the Town of Skaneateles Planning Board hereby approves the Extension of the Application, according to the terms hereof, with the Approval Resolution in full force and effect according to its terms, as extended hereby. Dunning tract Jun. 4, 2013. USGS. The title company for Grace Chapel is requesting an extension to the prior October 19, 2010 approval with specific wording on the resolution. There are no changes or adjustments to the lot pbm.01.15.2013 2 line adjustment; the applicant needs additional time to finalize the sale of the property and filing of the revised plat plan. 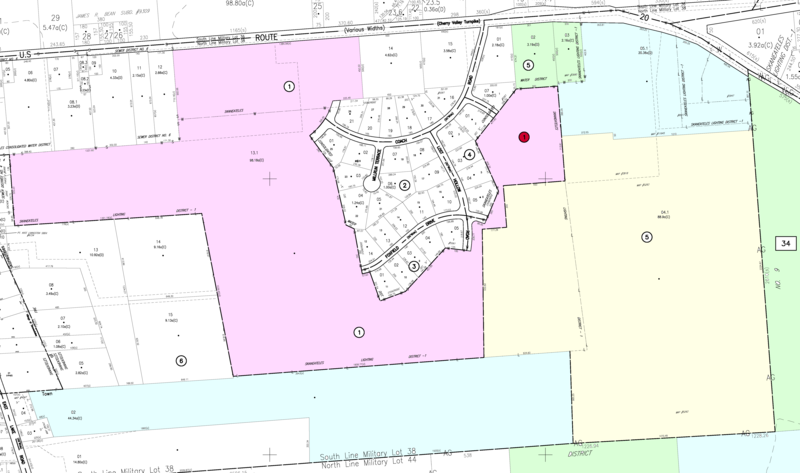 NOW, THEREFORE, BE IT RESOLVED, that the Skaneateles Planning Board hereby approves the Extension Request, and extends the Applicant’s time to file the map, deed and other documents to March 1, 2013. The Applicant or the Applicant’s representative shall immediately forward proof of said filing to the Secretary of the Planning Board upon receipt, with all other conditions of the Approval unchanged. Upon a motion made by Member Joseph Southern, seconded by Member Alan Briggs, and upon a vote thereon, the Town of Skaneateles Planning Board hereby approves the Extension Request, according to the terms hereof, with the Approval in full force and effect according to its terms, as extended hereby. Dunning tract neighbors as of 2014. – Craig Richards: Supervisor Sennett explained that the lease with Craig Richards is for a 50 acre parcel the Town owns behind Grace Chapel. Craig Richards said his family has farmed here for many years and he currently has 1500 cows and has rented this property since 1989. His row crops feed his dairy cows. Councilor Howard questioned if the property drains into Sucker Brook and if he followed Best Farm Practices. Mr. Richards said yes to both. Councilor Howard questioned why he didn’t spread manure on that property. Mr. Richards said that the Town put it in the contract that he could not spread manure. He noted that manure is excellent “green” fertilizer. Councilor Howard questioned what type of fertilizer he uses. Mr. Richards said EPA approved herbicides. Councilor Howard said she has no objection to spreading manure and she is glad he follows best farm practices to protect the watershed. Mr. Richards said he follows the whole farm plan and the CAFO program under Federal and State regulations. Councilor Howard suggested removing from the contract that manure could not be spread. Mr. Richards said that there are only certain times of the year you can spread manure he already has the seed in the ground for this year’s alfalfa crop which is in the 2nd year of a 3-4 year rotation, so he couldn’t spread anyway. He said if the Town Board wanted to change it next year he would be able to spread manure then. On a motion of Councilor Howard, seconded by Councilor Brace and with unanimous (5-0) affirmation of the Town Board, Supervisor Sennett was authorized to sign the lease agreement with Craig Richards.